A regular grooming session is vital for the dog’s all-around health and well being for which you need the best dog grooming brush. It not only leaves your dog healthy and comfortable but also makes sure the coat is kept flea-free and untangled. Any coats left to develop matted areas can lead to anxiety and discomfort for the pet. Also, regular grooming will get your dog familiar with the process and makes it easier in the long-term to check your dog is well and clean, as well as providing the shiny healthy coat. Using the grooming brush is also great for stimulating blood flow and distributes the natural oils in the coat. The best time to start grooming is at an early age to minimize the risk of a dog being afraid of this action. It is a great way to build trust between the owner and the dog. Also, try to combine interactive dog toys in the day-to-day activities for greater ease in bonding. I have invested a lot of time to research the dog grooming brush with blade options in the market. After analyzing the best products and considered factors like features and consumer feedback, these dog grooming brushes are the best picks. Why do you need a grooming brush? Grooming brushes vary in their effectiveness and it benefits to put in the time to find the right brush to match the specific type or breed of dog. This rule applies to all types of pet supplies, such as the dog collars and dog crates. 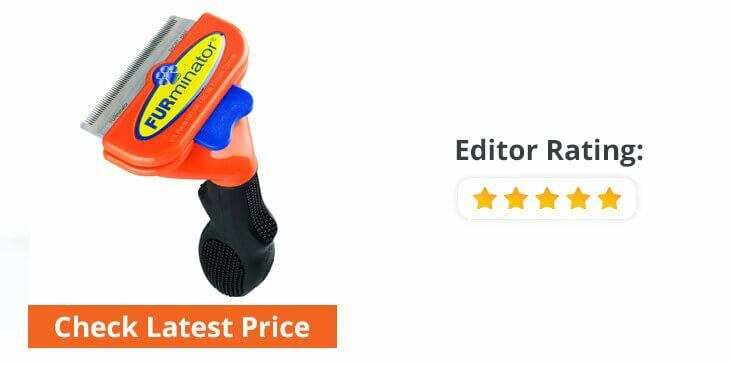 The FURminator deShedding Tool is a top rated grooming tool that is absolutely essential to remove loose hair quickly and easily. It has the ability to cut shedding by nearly 90%, which means so much less dog hair is left in the home on the floor, furniture, or dog bed. This tool for medium sized dogs (21-50 pounds) is intended to work on short haired dogs (shorter than 2 inches). It is an effortless process to remove the hair that would otherwise coat the home with black or brown hair. This is the type of tool used by the pros and easily reaches benefit the topcoat to gather the loose hair that is just waiting to fall out. A great practical feature is the ejector button to quickly remove the collected hair. It is built and designed by grooming professionals with patented technology to guarantee its ability to control shredding with greater efficiency than any other comb, rake, or brush. The Pet Grooming Brush by Pet Neat is the #1 rated new release in the pet supplies category and easily reduces shedding by up to 95%. 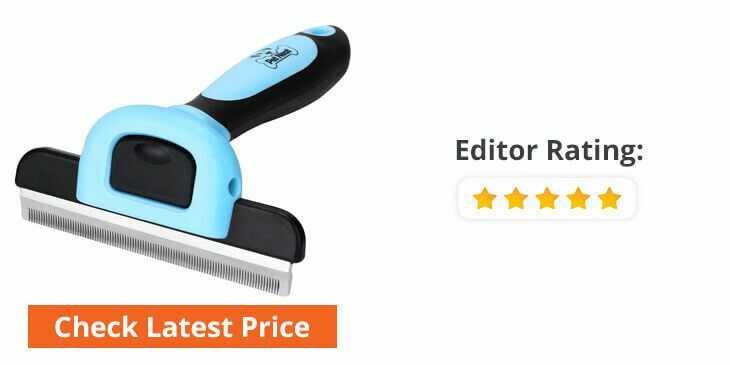 This is a professional quality de-shedding tool for dogs (also works equally well for cats) to quickly and cleanly remove the dead undercoat and loose hairs to leave the main top coat healthy and shiny. It is really easy to use and just takes 5 minutes of daily effort to maintain the shiny top coat. This type of tool is certain to appeal to the pet owners that often have to put up with pet hair dropped in the car or all over the house. Even after a single 15 minute session, you will see a dramatic improvement in the look of the dog’s coat. Plus, the regular brushing action helps to promote healthier skin for all-round grooming benefits. 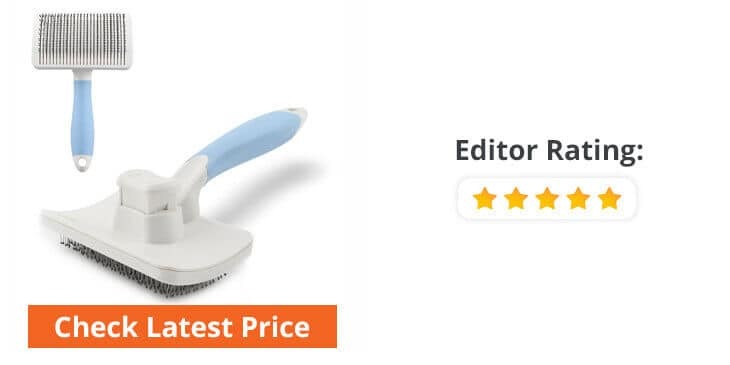 The PRODogs Pet-It Shampoo Massage Brush by Conair is easily cupped in the hand to give a gentle massage to fully stimulate the dog’s coat while giving a wash. The thick, rubbery bristle brush dog grooming tool makes it really easy to pass the shampoo or other pet care product through the coat. This brush is most effective when planning to give your dog a message. The easy grip design makes it possible to hold the brush to give the comfortable grooming session, while still able to maintain a pleasant petting motion. 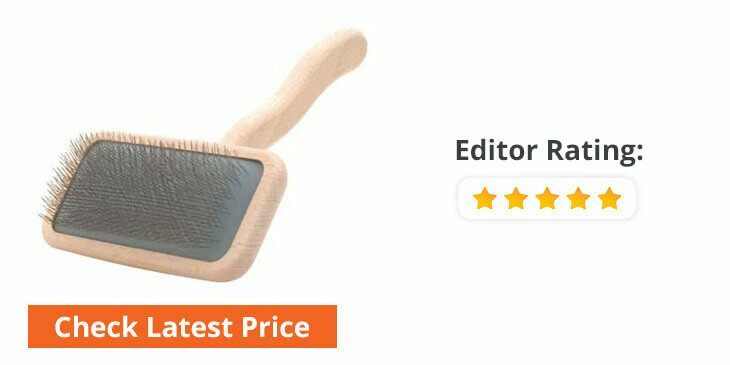 This massage brush is even a practical choice for the dog breeds with minimal fur or fat, as well as the young puppies. In addition to the dog shampoo massage brush, Conair also manufactures a few other grooming brushes, such as the curry comb, boar bristle brush, slicker brush, soft slicker brush, and pin brush dog grooming. 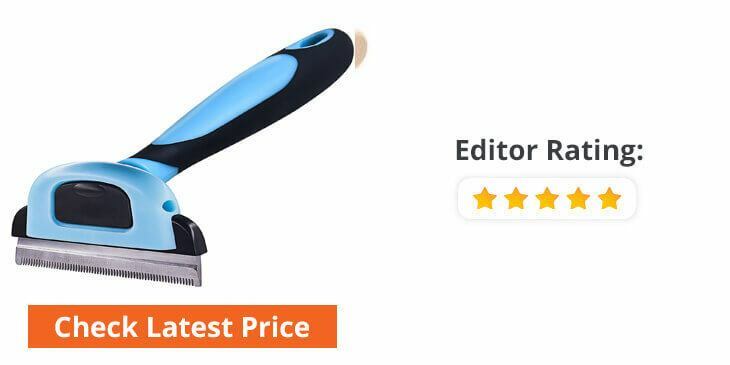 The Light Pets Deshedding and Trimming Tool by Harbo is a practical choice for cat and dog owner that are tired of pet hair all over the house. This deshedding tool is highly effective at reducing shedding by an estimated 95%. This tool is quick and comfortable to use and will not cause damage to the topcoat while leaving the skin healthy and the outer coat shiny. This type of tool is so much more effective than a traditional grooming brush, while also helping to clear any built up fur knots. The Pet Deshedding Tool is a versatile option with the ability to work well on removing the loose undercoat on a short-haired dog and can be just as effective on the long haired dogs. For ease in handling, the tool has a nice rubber-type handle which is non-slip and simple to use. Also, the teeth on this rubber dog grooming brush are smooth and wide to give the highest level of comfort while in use. The Automatic Self Cleaning Slicker Brush by Grand Line is designed to be an all-in-one tool to quickly clean and groom your pets. It takes little to clear the loose, dead hair to leave behind the shiny and healthy looking coat. The anti-slip and durable handle is comfortable to use for both pet and pet owner and makes it a practical choice for daily grooming sessions. 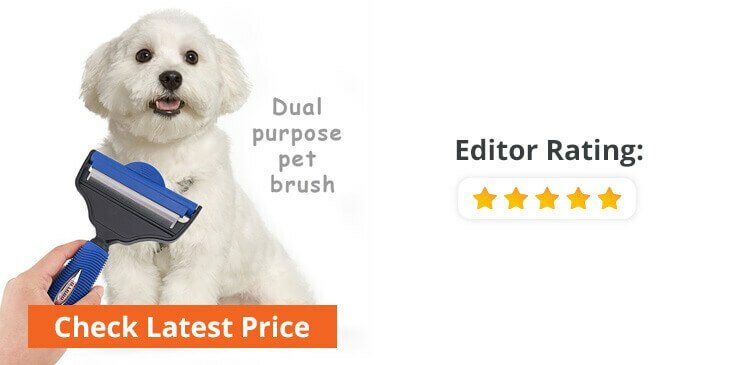 This self cleaning slicker brush has a brushing area of 3.5″ by 1.5″ and easily maintains the coat on the medium to large size pet (weight: 24.3 lb to 88 lb and height: 16.1″ to 27.6″). This can be considered one of the best dog brush for german shepherds and golden retriever. A regular brushing session will see this brush collect a high volume of dead hair that is no longer going to be left scattered around the house, and often falls in places it shouldn’t such as the dog food. The brushing tines are finished with a tiny rounded tip to minimize the risk of hurting the pets with sensitive skin. The SilCoater DUO by ActiVet is a German manufactured dog grooming tool. The DUO is built with a dual brush head to perform multiple functions. This means this tool is extremely versatile and gives the option to combine the ActiVet GREEN Pro Soft and the ActiVet GOLD SuperSoft Coat Grabber brush types. It is great for breeds with the thick coat that often seems to get tangled. This brush is really easy to use and only needs a short daily session to keep the mats away while causing no damage to the coat. Even though this brush doesn’t look the friendliest to rake across the skin, it does not hurt and will not leave scratches behind. Whether you have a Rottweiler, King Charles, Cocker Spaniel, Dachshund, Yorkie, Belgian Shepherd, Maltese or Pomeranian, the SilCoater DUO is a perfect tool for deep tangles and knots. The Original Deshedding Grooming Tool by SleekEZ is a practical option for the wire-haired and short-coated dogs. It is just 5-inches with an exclusive, patented tooth designed that has the ability to work on many different coats. This grooming tool is quick and effective at removing dander, dirt and dead hair. It is a highly reliable option for terriers, Chihuahuas or other breeds with the short to medium length coat. Many dogs have sensitive skin and cannot tolerate the longer-toothed brushes, so this tool is the perfect alternative. 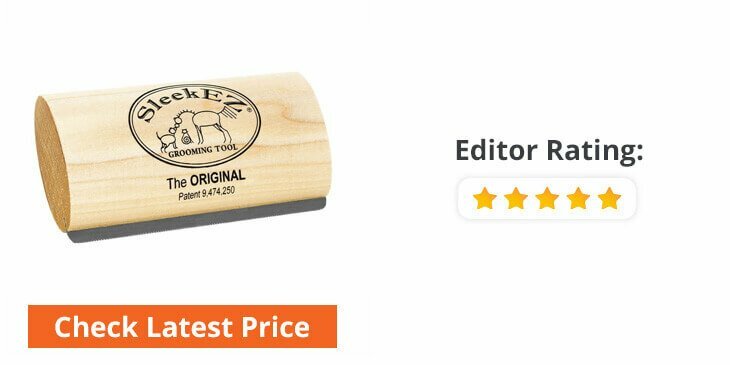 This grooming tool by SleekEZ is most effective on coats up to 3/8 inch. There is a slight learning curve to fully understand how best to brush your dog, but one that is understood the deshedding process should go completely smooth. Plus, this tool in made in hard-wearing high carbon steel to stand up to the test of time. The Self Cleaning Slicker Brush by Bozimolding is a useful tool to remove loose hair, mats and tangles. It is a practical choice for grooming both the short hair and long hair dogs. This brush is made of 100% TPR material to give long-term durability while also including antibacterial silver ions for greater protection. Also, the arc shape of the steel needles means it is possible to get to the undercoat and remove the loose hair as required. For complete comfort in use, the brush has a use anti-slip handle, so it continues to give a comfortable performance at the end of a 15 minute grooming session. This brush can be considered as the best dog brush for short hair shedding. Also, a further feature of safety is the balls on the needle ends. This helps to protect the skin from scratches while in use. The A5III Mark III Slicker by Chris Christensen is a high quality dog grooming tool from a manufacturer that has a solid reputation. It is well crafted of beech wood and its high grade steel pins easily glide through the coat and cause no damage to the coat. Plus, it is really comfortable to use with a nicely shaped handle that operates at a constant angle to avoid stressing the pet and groomer. The tines are a great length and easily reach the under coat to gently remove the loose hair, as well as tangles and knots. The actual size of the brush head is more than decent size to make sure it covers a lot of territories. A typical grooming session should take 10-15 minutes and clean dirt, grime, and little snarls. Once the dog has sat through a complete session, their coat should be clean and shiny with no signs of matting. The Dog Grooming Comb for Shedding by Paws & Pals is a quick and effective tool for deshedding the family pets. 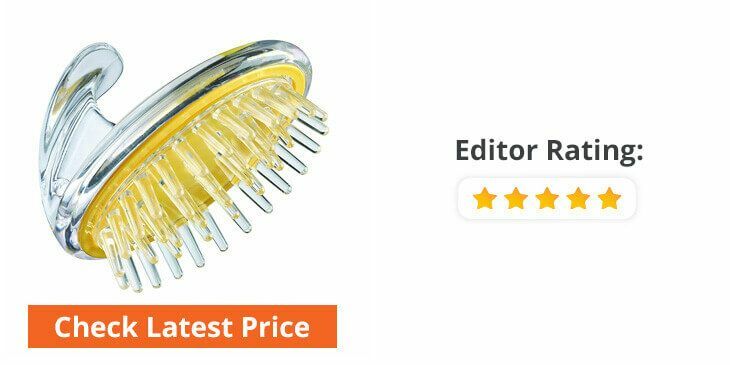 This is a professional-grade tool with gentle stainless steel bristles that will not stress your pet’s undercoat and fur. Plus the self cleaning feature means it is quick and simple to clear any of the loose hair left in the comb. Use the Paws & Pals tool to get rid of mats and tangled fur without causing harm or irritating skin. By removing the dead or loose hair you will not only make your pet a lot happier but also create the shiny and healthy coat. 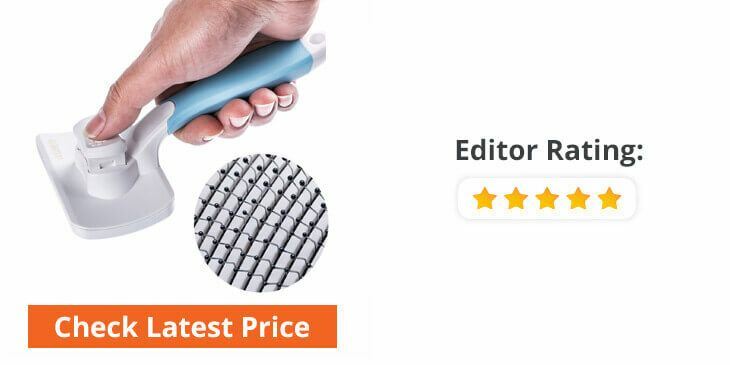 It is built to be comfortable to use with an ergonomically designed handle that gives the right leverage and control while brushing. This brush is practical for a wide range of dog breeds, including the straight, curly, short haired and long haired. A regular brushing of your dog’s coat should be a top priority, but for many dog owners it isn’t. A proper brushing session leaves the coat healthy and shiny and virtually removes the need to keep clearing fur from the rest of the home. A brushing session can take place as often as required and is a useful way to really bond with your pet. 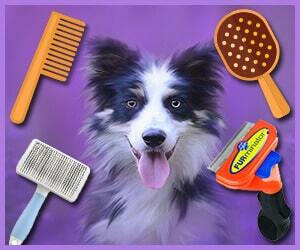 To get the best results from your brushing time, you want to use the dog grooming brush or comb. It is essential to choose the right type of brush for even the most straightforward home grooming. What kind of brush is best for my dog? It is very important to know a bit more about the grooming dog brush and the dog for which we are going to buy the brush. Just continue reading the following grooming dog brush buying guide and you will be able to choose the perfect one! The bristle brushes are a versatile option and practical for all coat types. But, the length and spacing between the bristles will vary to match the different breeds. For instance, the long and widely spaced bristles are the most practical for the long coats. Also, the brush with stiff bristles is needed for the coarse hair. 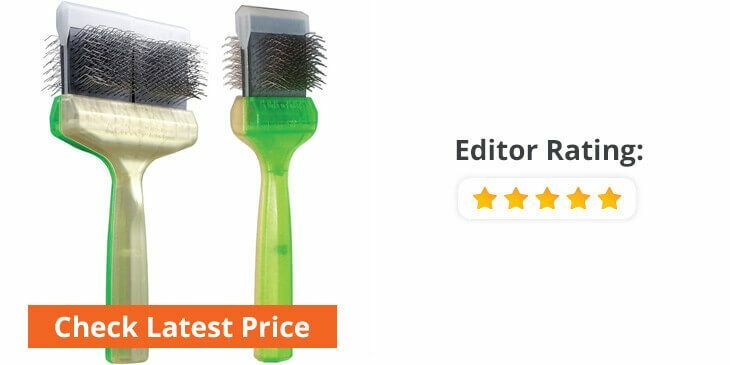 The wire-pin brush (rubber-tipped ends may feature) is one of the best dog grooming brush options for the dogs with medium to long haired coats, or those with woolly or curly coats. The slicker brush is designed to tackle tangles and mats with its fine wire bristles. The dog’s coat can have an influence on the right brushing technique. A soft to medium bristle brush is preferred for the breeds with a smooth, short coat, such as the Chihuahuas, Hounds, Retrievers, etc. It is most practical to brush in the direction of the coat’s grain. Also, the brush should have closely spaced and short bristles. Get your pet relaxed before starting the session using dog chew toys or similar objects to use up a little energy. A firm bristle brush with closely spaced, short bristles or even a slicker brush is the practical choice for the wiry, short coats, such as those seen on the Terriers. The best brushing action is to go with the coat’s grain. Also, the dog grooming rake brush is a useful option in this area. Use a soft to medium bristle brush with medium to wide-spaced bristles to groom breeds like Lhasa Apsos, Setters, Spaniels, Golden Retrievers, etc. Make sure to brush the dog’s coat in the direction of the grain. For the coat’s that are starting to show signs of mats and tangles, it is important to use a suitable slicker brush. The preferred type of brush for this coat is the firm bristled brush with wide-spaced, long bristles, or the wire-pin brush. This is useful for the Pomeranians, Chows, Shepherds, Collies or Sheepdogs, etc. The undercoat is best brushed going against the grain and on the outer coat go with the grain. Use a high-quality slicker brush to clean mats and tangles. A soft slicker brush or a wire-pin brush is the right choice for the Maltese, Yorkies, etc. With a delicate, thin coat. The brushing action can be with and against the coat’s grain. Other options include using the dog grooming glove brush for complete care. The best approach to grooming is to be careful and take your time. Be gentle and take extra care when attempting to remove tangles or mats. Try to make a brushing session something that is relaxed and comfortable with professional dog grooming brushes. By using a gentle motion on the dog’s skin you also provide a pleasant massage. It only needs two or three rips from snarls to make a grooming session something that your dog would prefer to avoid. A great way to build up the trust is to brush often. A daily schedule with the dog grooming brush is certain to get you into the habit of relaxing and staying still while the grooming takes place. How often should you brush your dog? The regularity of brushing your dog is certain to relate to the different breed and even the individual dog. But as a general guide, the short, smooth coated dogs can benefit from a brush at least once or twice per week, but the dogs with a silky or long coat are more likely to benefit from using the grooming brush on an almost daily schedule. If sometime you might miss it, do it when you get the time, don’t wait for the next day! For the dogs with long, silky, wiry, wavy or curly coats, it is often necessary to take action that goes beyond the basic brushing. A regular clipping session is also likely to become part of the grooming program. Clipping is useful for removing the most noticeable tangles and matting. Tangles not only make it more difficult to brush and manage the coat but also give a perfect place for pests and fleas to hide on your pet. So, make sure to use the right dog hair vacuum grooming brush or similar tool. With the best manual or electric dog grooming brush listed above, you can see there are plenty of high-quality options to maintain a healthy and shiny coat. The top items on our list are solidly built to give a reliable tool to get out the mats and tangles. You shouldn’t have any issues with investing in one of these dog grooming tools for the small to large dog breeds. Just make sure to buy the best dog grooming brush to match the specific needs of your pet.